15-day trial, watermark on Word output (trial becomes full working version when unlocked with purchased license). If you're not satisfied with Solid Converter Mac, return within 90 days for a full refund. 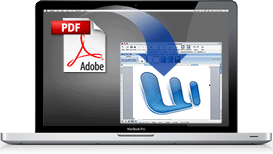 If you have not already done so, get the Solid Converter Mac free download trial. Once you have purchased our software you will receive an unlock code by e-mail. When you open Solid Converter Mac, select the option to unlock, then enter your unlock information. Please make sure to use the same e-mail address as when you purchased. All limitations will then be removed.